These gloves are designed to fit looser than standard gloves. They are more comfortable, and allow for some breathability. The loose fit means hands will not perspire as much and stay more comfortable than having hot hands. 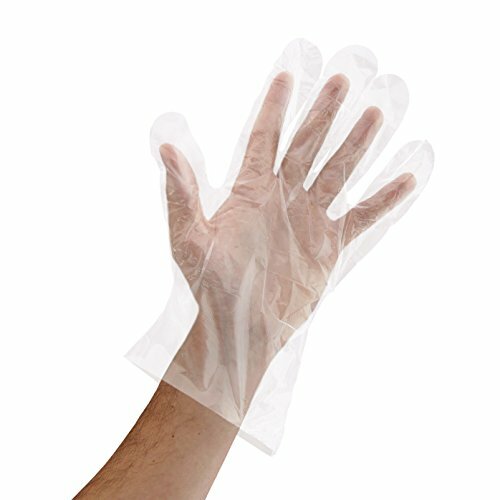 These gloves promote sanitary work and food handling practices in restaurants, commercial kitchens and bakeries. They are lightweight, and highly dexterous and comfortable to wear. They are made from clear plastic, and are safe for use with edibles. This product is latex free, so workers with latex allergies do not have to worry. They are comfortable to wear, and perfect for sensitive skin! COMFORTABLE AND DISPOSABLE: These gloves are comfortable to wear and gentle on skin. They have a looser fit than many other disposable gloves. These gloves are designed to be a one-time use item. Easy to remove, they are ideal for environments where changing gloves frequently is a necessity. FOOD SAFE: These gloves are made from low density polyethylene. They are safe to use in the preparation and handling of food items in restaurants, cafeterias, and more. Ensure customer and staff safety by using food safe gloves and other safety attire. LATEX-FREE: As a latex free product, poly gloves can be worn by people with latex allergies. They are made of thin plastic. INCREASED DEXTERITY: With a looser than average fit, these poly gloves offer greater dexterity in both hands. This allows the wearer to move more freely and perform tasks with ease. The looser fit causes the wearer's hands to sweat less, offering a comfortable wearing experience. FOOD PREPARATION AND PROCESSING! These gloves are perfect to use when preparing salads, sandwiches, slicing deli meats, and more. Ideal for use in restaurants, delis, grocery stores, and any other food prep location.